It's really been a tough year of Kokanee salmon fishing for many anglers on Whiskeytown Lake this season. Hundreds of anglers experienced some of the best Kokanee fishing in recent years in 2016 and just about everyone who fished for them found at least some success on the Whiskeytown Kokanee grounds. 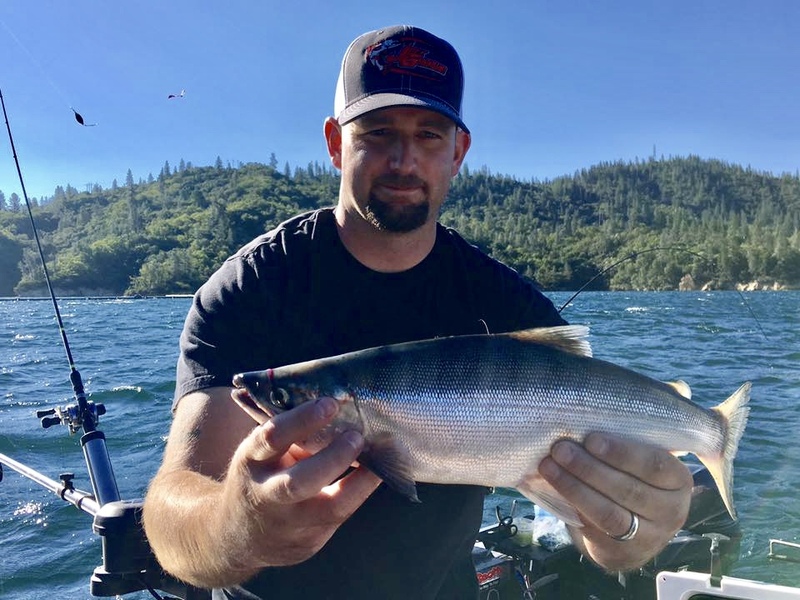 Coming off of a season like we saw in 2016, only to find much slower action this year, has been tough on a lot of people who fell in love with the Kokanee fishing Whiskeytown Lake can sometimes offer. 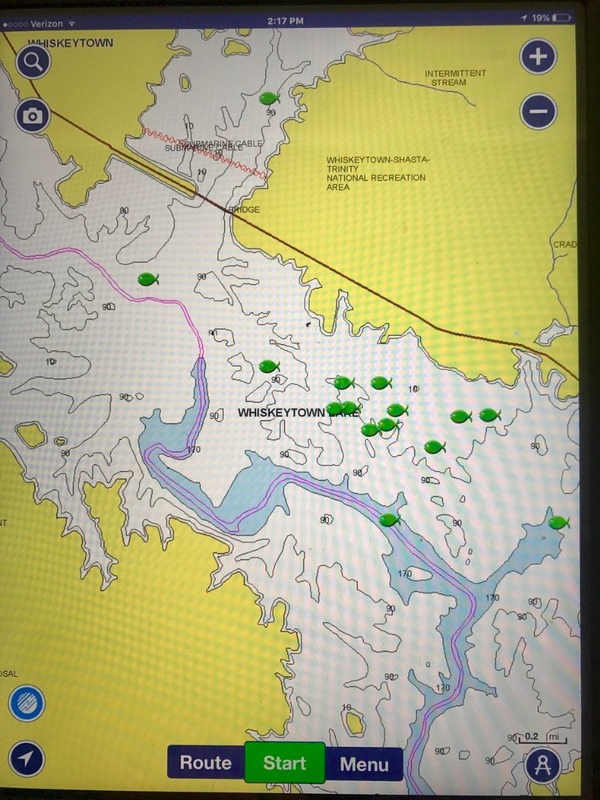 After reading about the slow fishing on Whiskeytown Lake and after talking with a lot of frustrated anglers at the Whiskey Creek boat launch, I thought I would share some of the tactics I've used this year on Whiskeytown Lake to successfully put limits to near limits in the fish box on every trip I've fished this season. 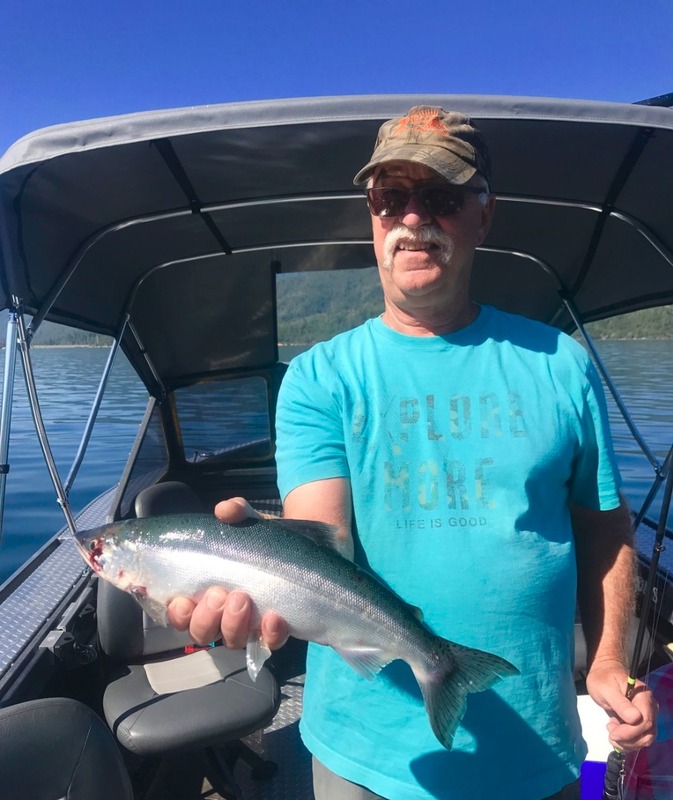 I've written in many reports this year on Whiskeytown stating that having A LOT of Kokanee tackle on hand to show the Whiskeytown Kokanee has been critical to my success. I want to drive that fact home, and if you get anything from this article, make sure it's this. Some mornings I have dropped a rod down and had a fish on before I could get a second rod out, but other mornings I've gone through several Kokanee rigs before I find one they want. To take it a step further, some of my best morning baits have become useless an hour later. A continuous and constant effort throughout the day to keep productive baits in front of this year's class of Kokanee is how you get bites on Whiskeytown this year. I will typically start my day fishing Kokanee rigs that have produced for me most often this year. It's not always successful, but it deserves a shot before moving on to something different. Usually, one of them will get bit right away. I have established a trend towards darker colored rigs working best early in the day and pinks and oranges working better for me in the afternoon. 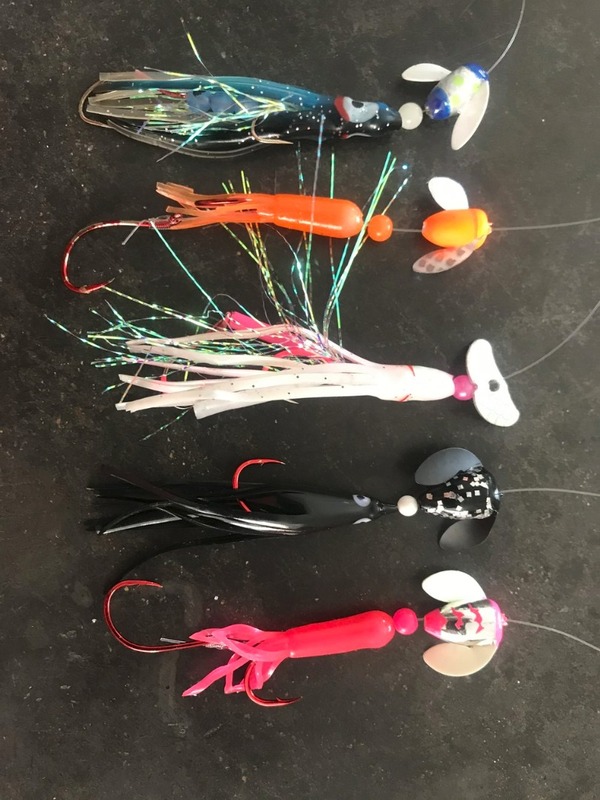 I will often times use black, purple, or blue hoochies and spin n glos on at least two of my four rods, and pink, orange, or white on the other two rods. More often than not, the darker baits are getting the most attention early. Make sure you notice when the dark baits stop producing bites because chances are, they have seen the best part of their day. If you are trolling through pods of fish you are marking on your sonar and not getting bit, start changing out to different colors or even color combinations. Tip your hooks with shoe peg corn soaked in garlic scent. Try different scents if you want, but garlic has been my go to scent for Whiskeytown Lake Kokanee. Ok, now that you have been given some ideas about what kind of baits you can find success with, let's talk about Kokanee dodgers. The first thing I consider when using dodgers for Kokanee on Whiskeytown is the size. I like to have a small dodger in front of my baits because with visibility that exceeds 25' feet in late summer, I don't believe these Kokanee need any more flash. In fact, sometimes I have my best bites on very small dodgers like the Crystal Basin "Wild Thing". Anything bigger than 4.5" inches is set aside for trout and land locked Kings on my boat. Here is something that I think is very important and really goes with what I have been talking about regarding bait selection. I know from experience that some dodgers will outperform others under different times of the day and different trolling depths. This time of the year when trolling depths can be as deep as 80' feet, I like to have a UV enhanced dodger down in front of the Kokanee. It's a solid choice every day, but it has its peak periods depending on the light penetration in the water. When the available light is low, like first thing in the morning, try using UV enhanced dodgers or dodgers painted with an opaque finish. A white Mack's Lure 4" Sling Blade dodger first thing in the morning is a solid choice and you'll see one on my boat every day. I was saying that the Kokanee will have a preference for a certain type of dodger, and I stand behind this statement 100%. It would be great to be able to throw just one kind of dodger on your line, but that's just not a reality as a fishing guide. Different sizes, finishes, and actions can make a world of difference some days. Change it up as often as you change your baits to see what the Kokanee want that particular day. I know, it's a lot of work, but if you want to fill your cooler with Kokanee on Whiskeytown, it's another piece of the big puzzle. 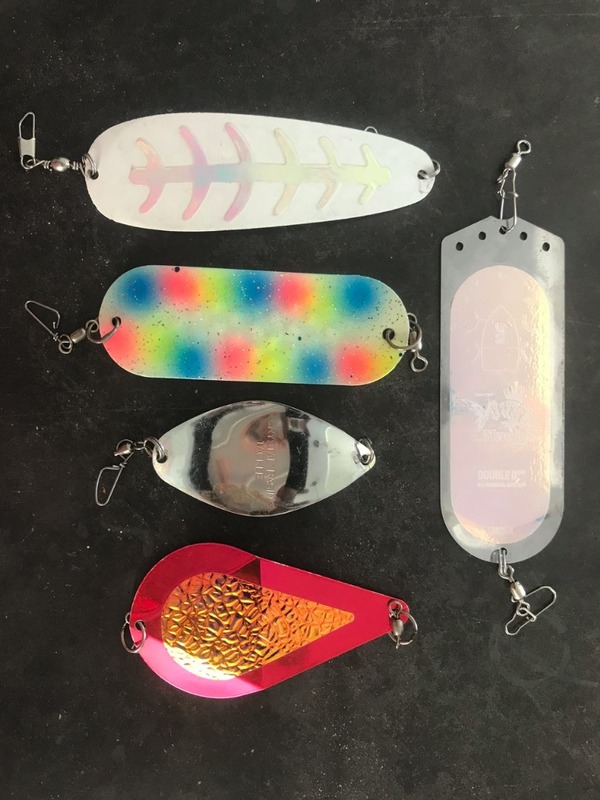 So now that you are using different dodgers with different actions, it's important to know how each one will impart action on your trailing Kokanee rig. I can say that 90% of my Kokanee rigs are about 8"-10" from the dodger and that seems to put the right amount of action on my Kokanee rigs using the dodgers I'm showing you below. Longer leaders will slow or eliminate the action, and shorter leaders will often times create too much action for the Kokanee to mess with. Constant yet a subtle pulsing action seems to be what they prefer. Different shapes and sized dodgers are an important part of catching Kokanee salmon on Whiskeytown Lake. These dodgers represent a starting lineup for me most days, but I can assure you that I have dozens more to choose from if these aren't producing. Early in the season, the water temps are usually in the low 50's so almost all of the Kokanee will be in the top 15' feet of the lake. Its important to know this because your sonar won't be of much help to you early on in the season. The Kokanee are just too high. This means you need to keep your rigs up high, 5', 10', or even 15' down and far away from the boat. As the water warms, the Kokanee will drop deeper and deeper until late summer, early fall when the temps start to go the other way again. This makes finding the Kokanee much easier because they will be clearly identified on your sonar. When the Kokanee are visible, don't spend a bunch of time fishing an area that's not loaded with them; move on to the next spot or troll until you find them if you'd like. There's no sense in wasting time fishing over an empty water column. If you fish Whiskeytown Lake often enough, you will know where to look for them. If you don't, ask someone, they are most often likely to help you out. One of my most valuable tools on my boat is my iPad that has a Navionics app installed. It helps me document productive areas on any body of water I fish. I use it everywhere except the Sacramento River up high where it doesn't really do me much good. When I start fishing Whiskeytown Lake in the spring, I will start to mark locations I have caught fish. Not every fish, just in areas I catch a bunch of them. I will use these locations throughout the season to find those fish again. Often times, I will troll over a spot I marked weeks or months earlier and catch fish there all season. Besides the locations you catch fish, it's important to keep tabs on the water temps in the lakes throughout the season. The best way to accomplish this is to have a Fish Hawk water temp recording device. You attach the Fish Hawk to your down rigger and send it down to your desired depth, say 100'. You then retrieve the Fish Hawk by running your down rigger back up to the surface. This device records water temps every 5' feet as it goes down into the lake. You can easily retrieve the recorded temps by scrolling through the view button on the Fish Hawk. The temps that are between 48 deg and 56 deg should be noted. This is most likely where you will find the Kokanee biters. Two tools here that I use every day and rely upon to help me stay on top of my game on the Kokanee grounds. Finally, you have everything in place to start your day on Whiskeytown Lake. Your starting lineup has been selected, and your location and depth determined. Now it's time to drop your Kokanee rigs into the strike zone and start working for those bites. Even if you have all of the aforementioned boxes checked, if you screw up your trolling speed you might as well just enjoy your boat ride. if you can't determine or control your boat speed, you have significantly diminished your chances of catching Kokanee. My eyes are constantly glued to my Lowrance, making sure I am over fish and I am trolling at the correct speed. Too slow or too fast, and the bites will be far and few between. I have found that staying somewhere near 1.3 mph on Whiskeytown Lake is the most productive trolling speed. Slightly under or slightly over, and you'll be alright. Whiskeytown Lake has been windy this year and if you aren't paying attention during windy conditions, you'll spend half of your day trolling to fast or too slow. I try to keep the bow into the wind if possible because it gives me the most control to maintain boat speed. If the wind isn't too bad, I'll troll with the direction of the wind, usually to the east, as long as it doesn't push my boat over 1.5 mph. If it does, you have two choices. Troll against the wind or head for calmer waters. Calmer waters can usually be found in the Whiskey Creek arm or up by the Clear Creek arm (Oak Bottom).